The social networking sites are an indispensable aspect of our daily life today. However, the constant inclination to the social media throughout the day has shown unproductive attitude among many employees of late. Thus, every business is needed to follow social media policy template that will specifically highlight the rules and regulations to be followed by every employee in the office- in regards to the use of social networking sites while at the workplace. It’s to assure that no unmindful use of social networking sites takes place. You may also see HR Policy Templates. 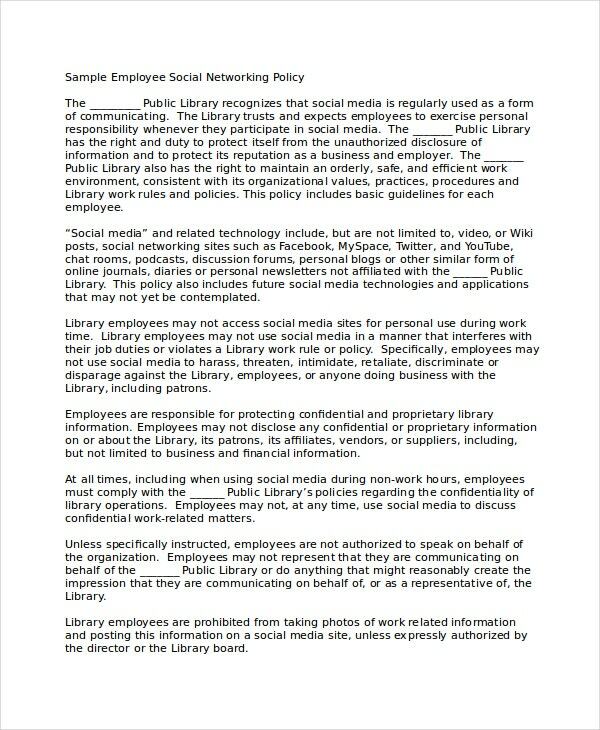 If you are looking for social media policy templates for your library, this template here would be useful for you with its elaborated text on what is allowed and what is not allowed for employees regarding use of social media in a library. You may also see Environmental Policy Templates. 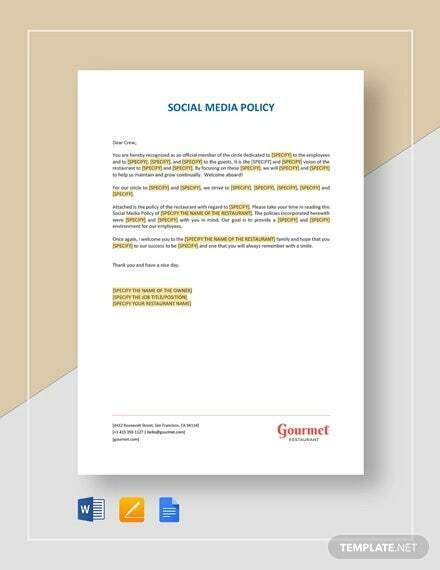 You have a detailed social media policy template for a company which has all the major sections you have to include in such a policy, like- the purpose, the definition of relevant terms, company policy and guidelines, enforcement, etc. 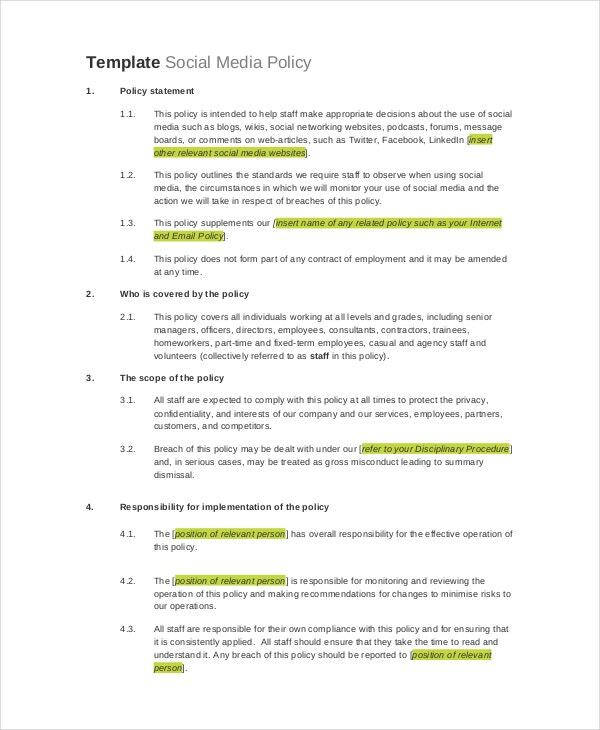 This social media policy template would be helpful for any bank looking for a standard guideline on how to formulate such policies for the employees. The template comes with detailed guidelines on what is expected of employees regarding their behavior in social media. 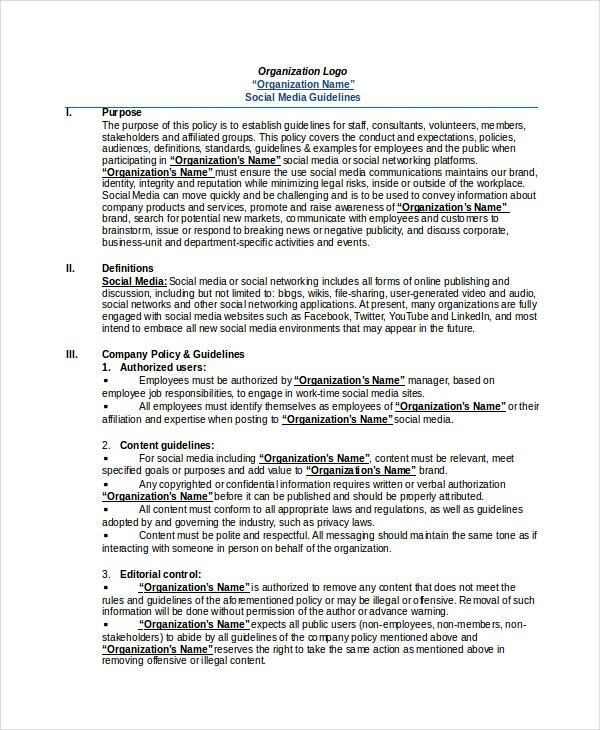 The template here comes with sections on the different guidelines that the employees are to take care of while using social media. 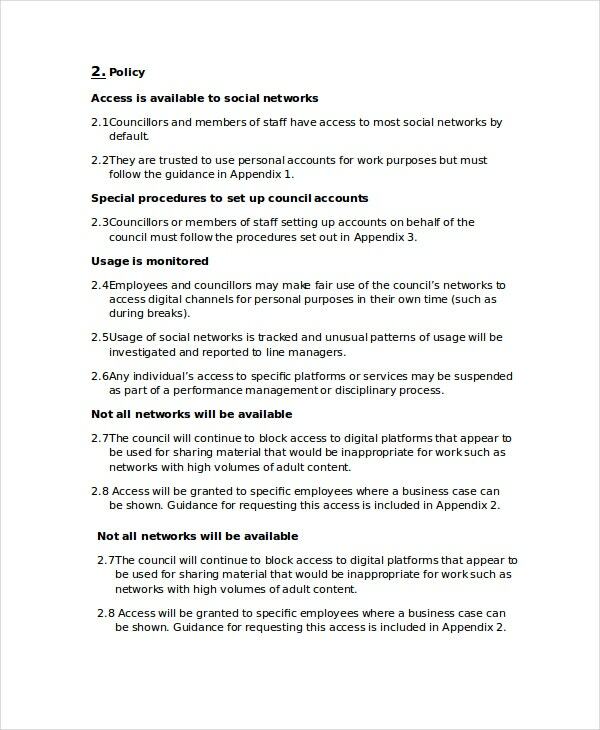 The document also contains a risk assessment table evaluating what unwanted outcomes the company might face if it’s too radical with social media usage by employees. 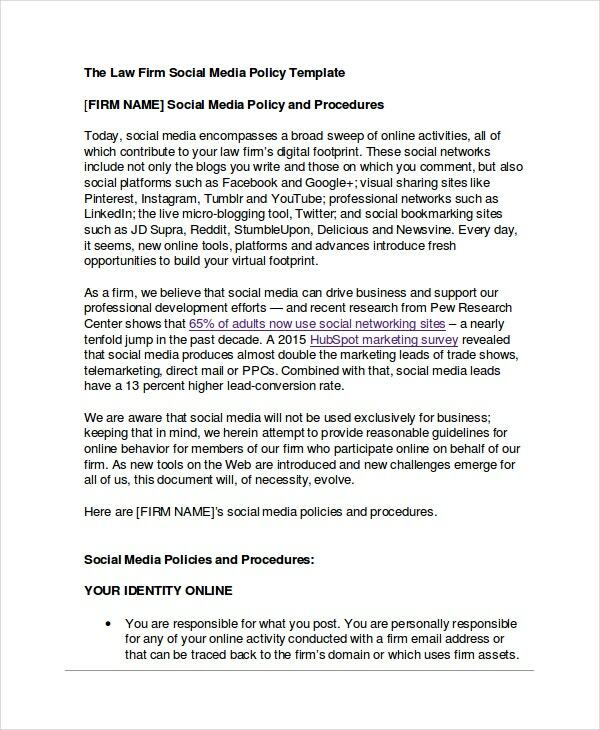 If you want to know what to cover in law firm social media policy templates, you have the ideal document here. The template underlines the different principals the firm executives should keep in mind while preparing the said policy for employees. > How to Implement a Social Media Policy? It’s important for every employer to implement social media policy in his company to ensure an effective monitoring of social media usage among the employees. To implement a social media policy in your company, you must first accept that you cannot eliminate social media from the lives of your employees. You may also see Policy Memo Template. Thus, your policy should acknowledge the practice of social networking among staff but then you can always specify guidelines on using it. 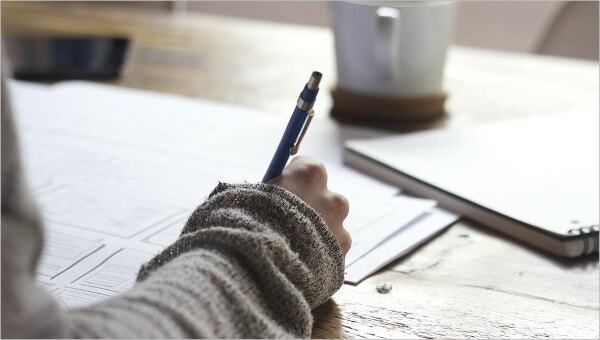 However, you have to make sure, your policies, in any way, do not infringe the employee’s basic right to take breaks as well as do not make them compromise on your company’s work ethics and production quality. 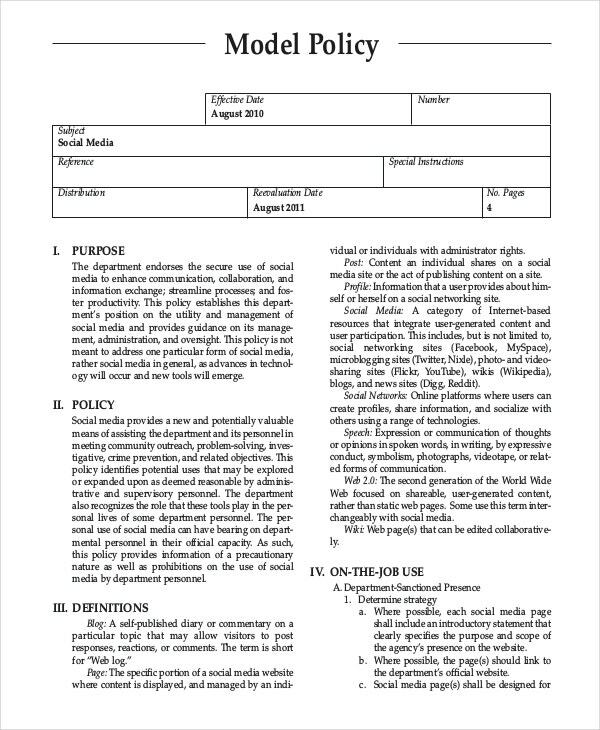 You can check out social media policy templates for a good idea. > What to Include in a Social Media Policy? 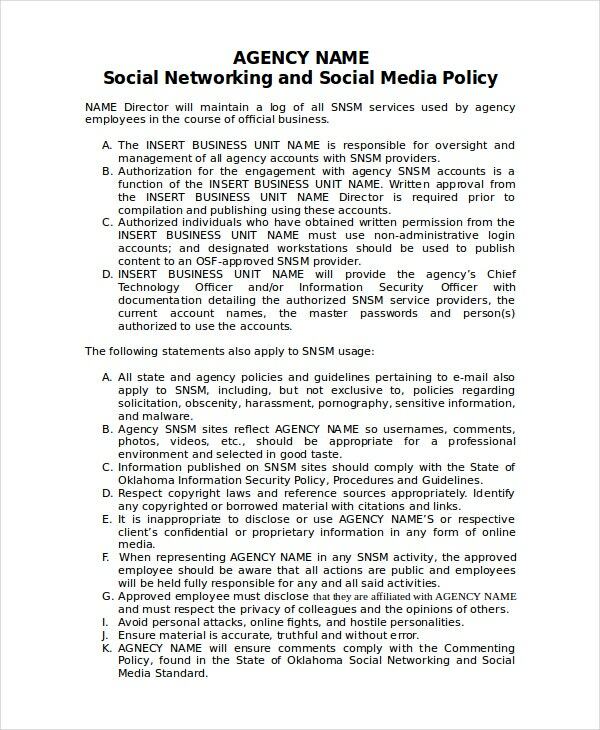 Are you about to write the social media policy for your company? Well, that’s much needed today for any kind of office. 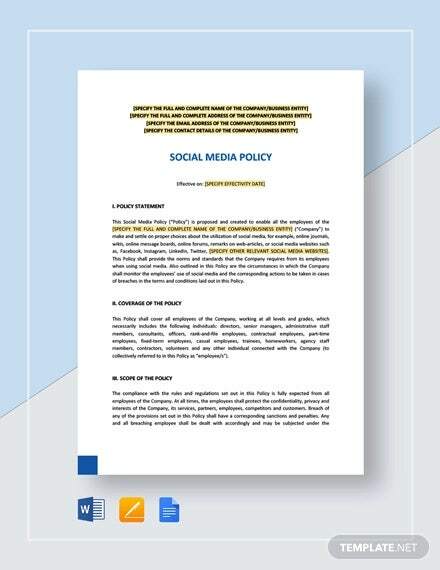 The standard social media policy templates usually start with a note on the purpose of such a policy that defines the significance of such a policy. Then, the policy would go on defining the different rules and regulations set by the company regarding the usage of social networking sites among the employees- like which sites are allowed, when can the staff use the social networking sites, what can the staff post on social media sites and what social networking activities are prohibited for the employees. You may also see Quality Policy Templates. > What is the Purpose of Social Media Policy? With the contemporary world getting increasingly “social”, the social media sites are now an integral part of our lives. It’s great to connect with friends and relatives over Facebook or Twitter but not when your client has imposed a tight deadline on you. Thus, it’s of utmost importance for all companies to go for social media policy templates that will help them to establish their rules and regulations regarding the use of social networking sites while in office. You may also see Company Policy Templates. The policy is needed to educate the staff about the guidelines they have to follow regarding access and use of social networking sites while at workspace- which in turn assures that the quality of production is not compromised for personal entertainment of the staff. A social media policy is a vital part of the business policy followed by any office today. 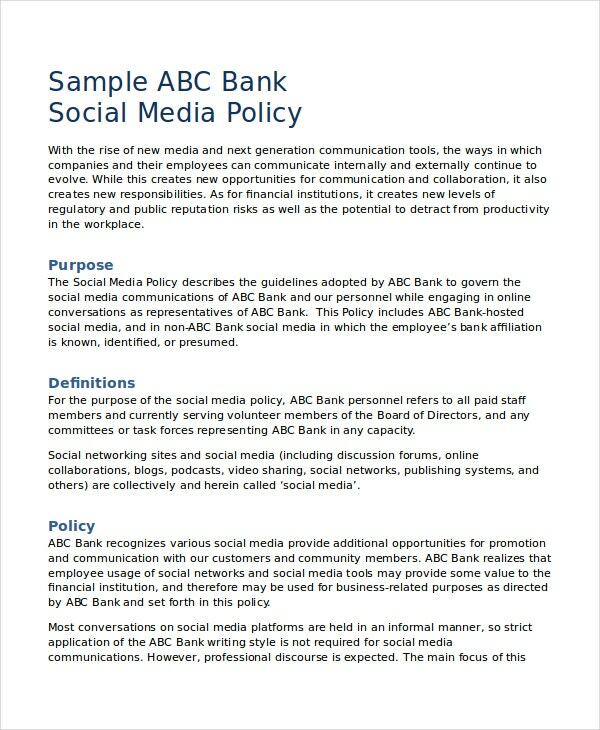 Whether it’s a bank or a library or a corporate house- every organization needs social media policy today. Do you need some ideas on how to structure a proper social media policy? Well, in that case, you can always take to the pre-structured social media policy templates for inspiration.